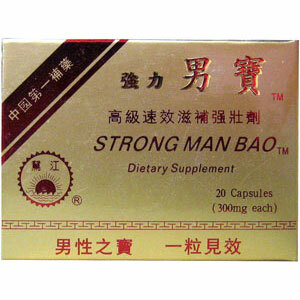 Strong Man Bao helps enhance male vitality. Male impotency, backache, general weakness. Strong Man Bao helps enhance male vitality. Enhance male vitality, promote male rejuvenation and performance. Male impotence, backache, general weakness. Take 1 to 2 capsules, 2 times a day. Do not give this product to children or pregnant women.